There are many hundreds of technical manuals for repair of Toyota and Lexus vehicles. Selecting the correct manual for the vehicle you wish to repair can be confusing. The following information and example will assist in selecting the correct manual. Before you can select the right manual, you must accurately identify the vehicle to be repaired by locating the Model Code on the Vehicle Identification Plate. The plate is typically located in the engine compartment but may also be located elsewhere on the vehicle. The illustration shows typical locations for vehicle identity plates on Toyota or Lexus vehicles. The vehicle identity plate contains the vehicle identity number, engine number and model code. The vehicle Model Code, similar to that shown below provides a complete identification of the vehicle type including model, engine, transmission and body type. Only the basic model code is required to search for manuals. 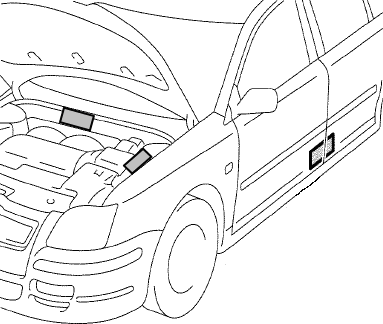 In this example, ZZT250 provides sufficient information to search for Avensis manuals. A complete explanation of the model code is provided within the first few pages of each New Car Features manual. These can be viewed on-line by selecting the appropriate model (in this case Avensis) and New Car Features from the Publication Type drop-down lists.